Summertime is made for outdoor living. Whether it’s a cup of coffee in the morning sun, an afternoon in the shade with lemonade and a good book, or dinner under the stars serenaded by crickets and cicadas, these long summer days and languid twilights entice us to spend time relaxing with Mother Nature. Creating an inviting “outdoor room” allows you to enjoy al fresco time in comfort. Whether it’s right outside of your sliding doors or a destination down the garden path, an outdoor room is more than just a patio with chairs; it’s an exterior space that feels like an extension of your home. An outdoor room can be big or small, grand or simple, as long as it’s a place that seems both intentional and inviting. Screened porches, verandas and covered patios, pergolas and gazebos are all natural spots for an outdoor room. They provide shade and shelter, as well as define the parameters of the outdoor room. If you have one of these features on your property, chances are it’s already at least basically outfitted for outdoor time. You can also create an outdoor room on an open terrace or patio by framing the space yourself. If shade is desired, you can purchase a metal garden gazebo or shade sail for the season, or even build a basic pergola. For long-term goals, wooden pergolas look wonderful when softened by a climbing vine such as clematis, wisteria or climbing rose. If you prefer not to use a manmade structure, small trees planted near the edge of a terrace can also be your “roof.” Crepe myrtles offer summer flowers and an arching shape that works well for an open-air room, while Eastern redbuds are relatively fast growers with heart-shaped foliage. A simple shade solution for smaller spaces is a market umbrella, which these days are readily available in an array of colors and options. Along with the traditional style, market umbrellas can be square or rectangular, tiltable, feature built-in lighting, and come with different stands for various furniture arrangements. Cantilevered or offset umbrellas are a good option for a seating group, since the base can be placed behind the furniture instead of in the middle of the action. Part of what gives an outdoor space the feeling of a “room” is the illusion of having at least one wall or boundary. If your outdoor room is against your house, you’re probably all set. But if you’re creating a space that is free-standing, there are several options. Large potted plants are a great way to define the borders of your space. Use them at the corners, or several in a row for a living wall. 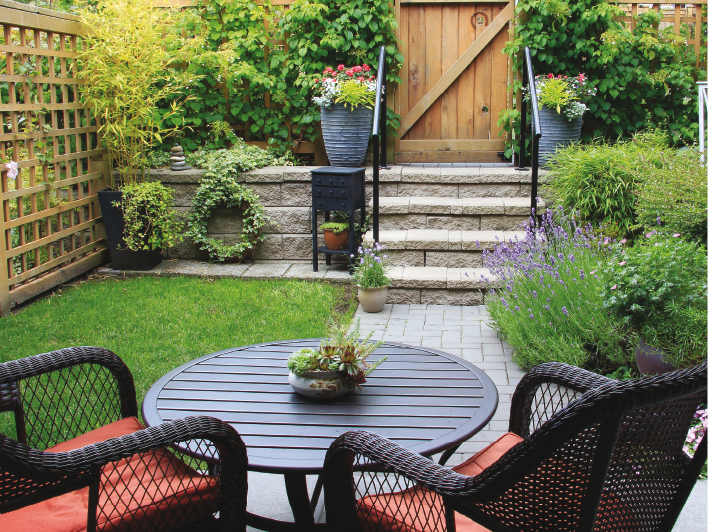 If you have, or can install, a low retaining wall, it will both define the space and provide extra seating. An outdoor rug will make the space feel like a designated gathering area, and anchor your outdoor furniture. You might also be able to play around with your furniture placement to create a sense of boundaries. Try out a couple of different options and see which arrangement feels right. Whether your outdoor room is covered or open air, privacy can be a factor. If additional privacy is desired, some of the features that define your space can serve double duty. For open air spaces, foliage is your friend. Small trees and hedges will provide a wall of greenery, as will those large potted plants. Banana plants and hibiscus impart a lush, tropical feel, while Italian cyprus, dwarf spruce, or sky pencil holly offer a more structured, formal look. There are modern updates to that old privacy standby, lattice, that can work for both structures and open spaces. “Square” lattice, as opposed to the traditional diamond style, is a fresh, tidy look that offers privacy and diffuses light without overly darkening the space. Try framing out individual panels of lattice, which can then be hung from a beam or built on a stand. Using a free-standing screen offers the additional bonus of moving it when and where it’s needed. A privacy screen made of horizontal boards looks modern and clean, and using reclaimed lumber will give it rustic charm. Shutters can also be mounted into a frame—paint them a fun color for extra interest. Outdoor roll-up woven blinds and curtains are easy and attractive options for spaces that have a beam or pole for hanging. A fun variation you can do yourself is to use industrial pipe for rods, and canvas drop cloths for curtains. Attach the curtains to the rods with large curtain ring clips, and use jute rope for tiebacks. It’s an affordable option that adds effortless style! Once you’ve established the basic requirements and parameters of your outdoor room, it’s time to talk tables and chairs. Before you outfit this room, decide what you want to do there. 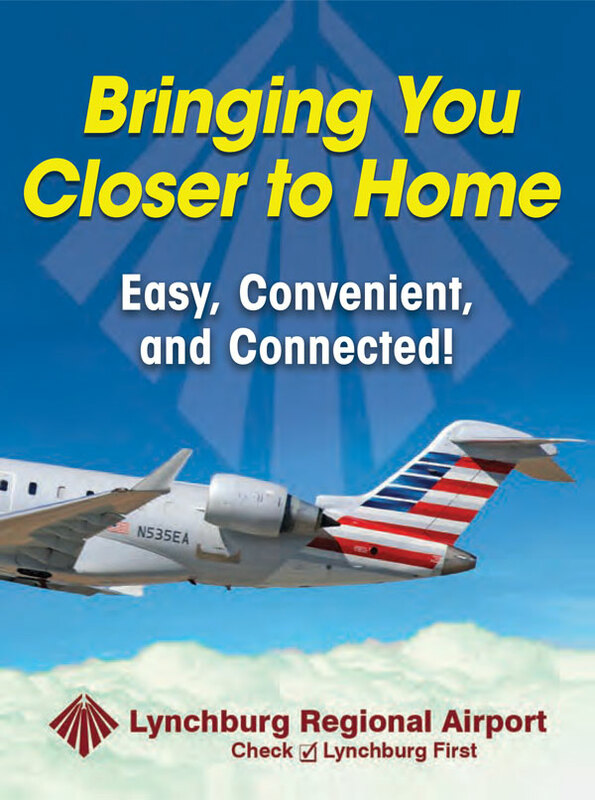 Do you picture it as a place to eat meals, which will require a dining table and chairs? Is it going to be a place for visiting that will need a good seating arrangement? A place to relax, with a hammock or swing? A place for barbecuing, or entertaining? If you’ve got the space, it’s likely that your outdoor room will fulfill more than one of these functions, so here’s where scale matters. If you’re working with a large blank canvas, you can divide it into zones, such as a space for grilling and eating, plus an area with conversational seating like patio sofas and chairs. Chunky, rattan-framed furnishings can help fill up an expansive space, while a bistro table with two chairs might fit perfectly into a private nook. With the outdoor room’s size and function in mind, you can have fun with all of the outdoor fabrics that are available. Indeed, an outdoor rug will help define the space, but can also provide an extra dose of color and style. There are a multitude of colors and patterns that are available both in stores and online, so no longer are you limited to monochromatic beige. Play with stripes, chevrons, trellis, kilim and floral patterns if you feel inclined. Outdoor throw pillows can pick up accent shades from a colorful rug, or continue an indoor room’s color palette, blending the inside with the outside. 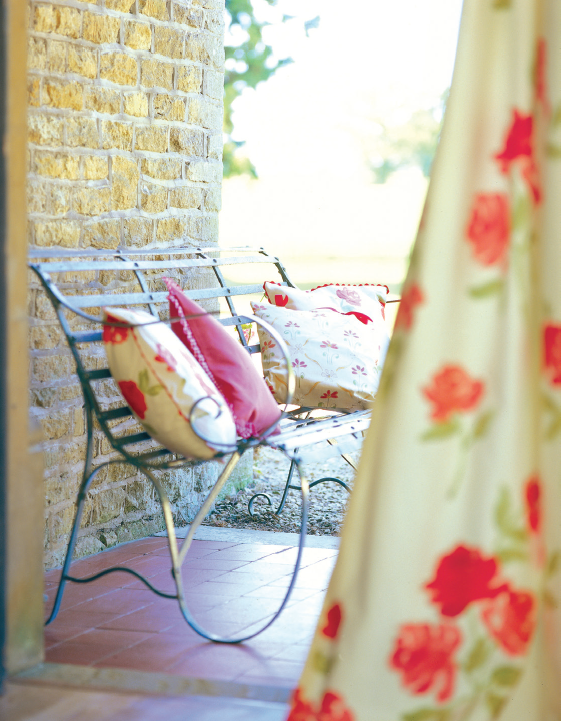 It can also be fun to use outdoor fabrics to provide a contrasting punch to your adjacent indoor theme. Gray-toned interiors get a lively boost from yellow- or red-toned outdoor touches; almost any shade of blue looks great when paired with a cheerful pop of coral or orange. An outdoor room is a great place to go bold or introduce a fun color. Let your creativity flow! While shade is important on sultry summer days, don’t forget the need for a bit of lighting on those starry nights. There are plenty of glamorous outdoor chandeliers and high-tech garden lighting options available if you’re interested, but you don’t have to break the bank here. Budget-friendly options like twinkle and strand lights provide a romantic, bohemian feel. Simple tiki torches from the garden center can also add a bit of brightness to the night (and possibly repel mosquitos, to boot). 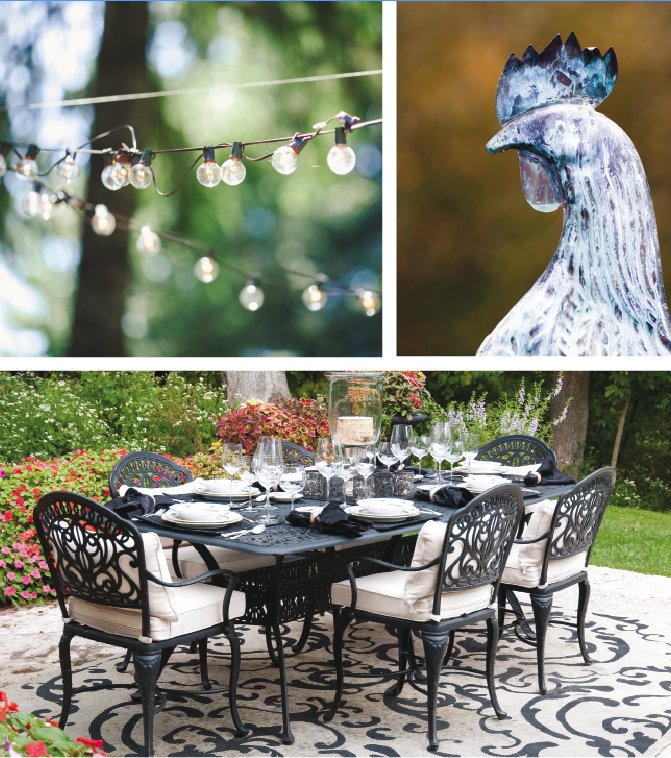 Outdoor chandeliers don’t have to be hard-wired; some of the most enchanting pieces feature candles arranged in everything from antique wrought iron to mason jars and reclaimed wood. A funky old chandelier from an antique or thrift store can be easily repurposed for a unique feature. For exotic, Old World glamour, hang a cluster of Moroccan lanterns at varying heights from a beam or tree branch. They come in an array of shapes and colors, and those with pierced metal housings will cast gentle, intricate patterns on nearby surroundings. 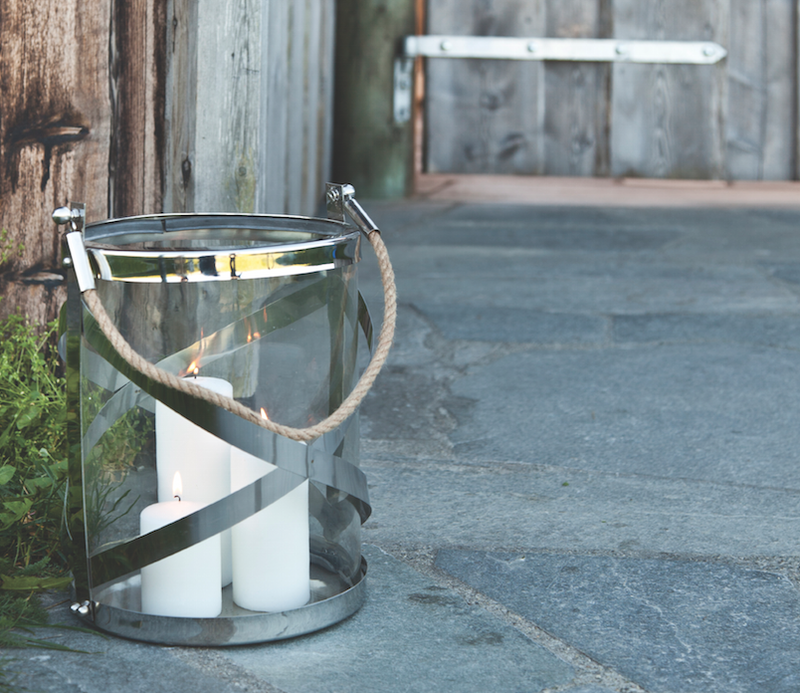 There are also tabletop versions of such lanterns, as well as more traditional options like hurricane lanterns framed in metal, rattan, or even rope, which convey a clean, modern feel. Remember that, while light is useful, there can also be too much of a good thing. You want a soft glow rather than a deer-in-the-headlights ambiance, so eye-level lighting that has some sort of shade, or a frosted or colored housing, is always a good choice. Using a low-intensity option, such as a small votive or battery-operated candle, is easy and inexpensive. Don’t forget that solar lights are hard to beat for convenience, and come in more options than ever before. You can use solar spotlights at the corners of your outdoor room or pointed up at nearby foliage, which will provide pleasing ambient illumination as well as highlight the features of your space. So you’ve got all the essentials for an outdoor room—what can you do to take it to the next level? For many outdoor spaces, a fire feature is the natural focal point. A wood-burning fire pit, whether built-in or simply a large metal bowl, is affordable and fun. Installing a gas fire pit costs more, but offers smoke-free fire at the flick of a switch. Fire pit tables are popular and chic, and do double duty for holding food and drinks. Outdoor fireplaces are a welcoming accent to patios, and can also be wood-burning or gas. Some even have built-in pizza ovens or TVs—definitely a “wow” factor! A ceiling fan is a nice extra if your arrangement allows for it, both for the cooling breezes and for keeping flying bugs at bay. A water feature, such as a small pond or fountain, is relaxing and also good for providing white noise where needed. Finally, don’t forget about purely decorative touches. salvage shop, statues, or even a unique piece of metal garden art can all add a bit of whimsy to an otherwise conventional space. You never know—that three-foot-tall metal rooster you’ve driven past at your local garden store could be the talk of your next barbecue! Putting together an outdoor room allows you to expand your seasonal living space, enjoy the outdoors in comfort, and have fun decorating. A little forethought, a few essentials, and a touch of imagination can create a retreat to beat the heat, or soak up the sun, as you choose. 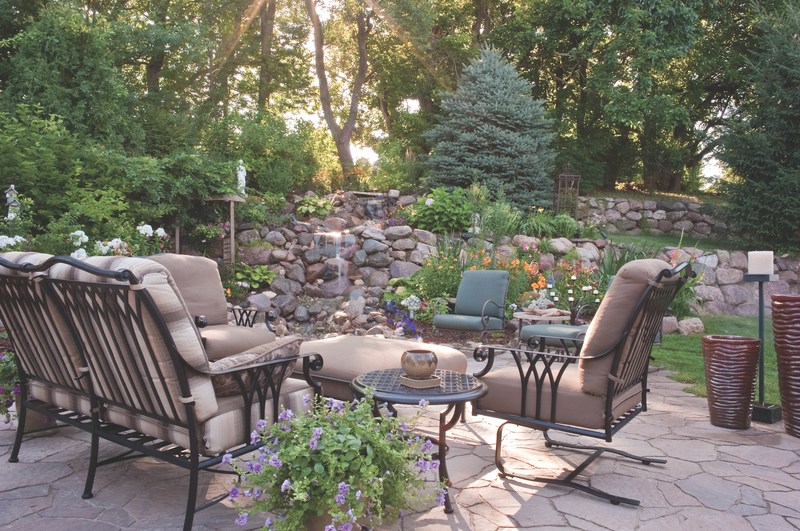 With the right outdoor space, come summertime, the living really can be easy!